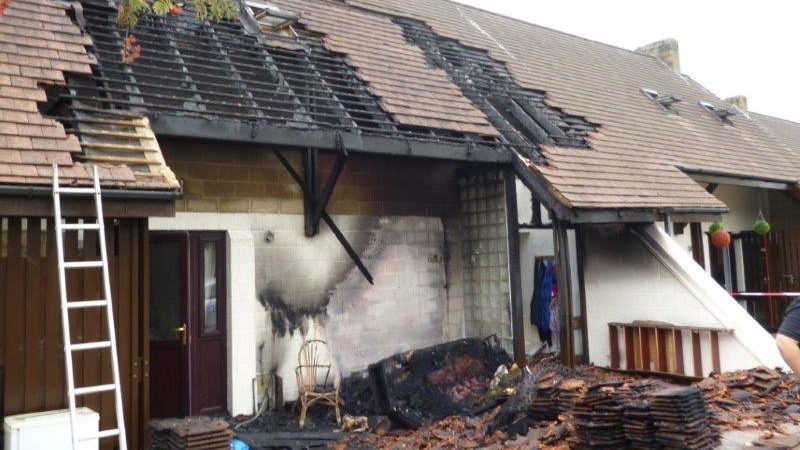 Following a fire, extensive damage was caused throughout the first floor of a housing association tenanted home decimating the roof structure and front elevation. Smoke damage contaminated the remainder of the property. Loss adjuster agreement led to Metcalfe Briggs Surveyors being instructed by a long-term housing association client to prepare a specification of works designed to bring the property back into habitable use, organise competitive tendering and act as contract administrator through to completion and end of defects. An interesting situation arose during the administering of the contract. The property formed part of a larger housing development constructed circa 1994. Part of the architectural design was to use French produced roof double tiles. Whilst great efforts were made to source a supply of second hand tiles to match, this was unsuccessful. The solution agreed by all parties was to salvage existing tiles from the rear elevation to ensure that the front roof slope maintained its appearance from street view whilst modern interlocking tiles were used on the rear elevation which overlooked adjoining gardens. The project value was £80k and was successfully completed and handed over to the housing association for re-letting.